When the 27th Annual National Cowboy Symposium & Celebration kicks off in Lubbock on September 11, the Lubbock Memorial Civic Center will play host to one of the largest and best Western heritage and cowboy culture events in the country. The three-day, family-friendly event includes musical acts, storytelling, author panels, demonstrations and more. We asked event organizer Monica Hightower, who’s helping to plan the symposium for the ninth time, a few questions to give us some insight into the planning and execution of this year’s event. In a word: Celtic influence. This is the first year the group Cowboy Celtic will be performing at the National Cowboy Symposium. Hightower and her team have also developed special sessions about Celtic influence in the American West to build off of Cowboy Celtic’s appearance. A Friday luncheon will feature Celtic dancers and ranch dancers with a discussion comparing the similarities and differences between the two. Who else is in the entertainment lineup? Some familiar favorites return this year to the entertainment lineup including performer Pipp Gilette and cowboy poet Mike Dunn. Why does the event’s popularity continue to grow? Plus, she says the food is always an attraction. “It’s a lot of fun to come out and see all the chuck wagons,” she says. The chuck wagons are a personal favorite for Hightower—she is a member of one of the event’s chuck wagon teams. “You can’t go get a chuck wagon meal any Friday night you decide you want to one,” she says. 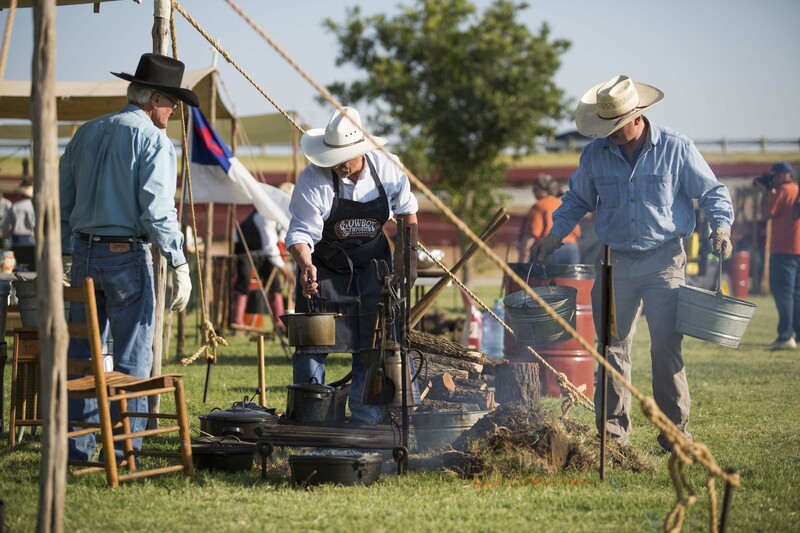 The event’s National Championship Chuck Wagon Cook-Off is always one of the crowd favorites. What makes the National Cowboy Symposium so special? First, this is an event for people of all ages, Hightower says. There are activities geared toward small children and other discussions and sessions that appeal to adults. And Hightower thinks there’s no other place like Lubbock that could host the National Cowboy Symposium & Celebration. “Lubbock has a real history in these roots,” she says. “And it’s a large enough city with enough rooms for the event.” She says that a lot of people end up making a vacation around the event, filling an itinerary with complementary attractions including the National Ranching Heritage Center, Bayer Museum of Agriculture and the American Wind Power Center. How would you describe the event to friends? Hightower and a few other members of the planning crew will be set up during the First Friday Art Trail in August and September with a concession trailer, answering questions about the event. The National Cowboy Symposium & Celebration takes place September 11-13, 2015, at the Lubbock Memorial Civic Center.